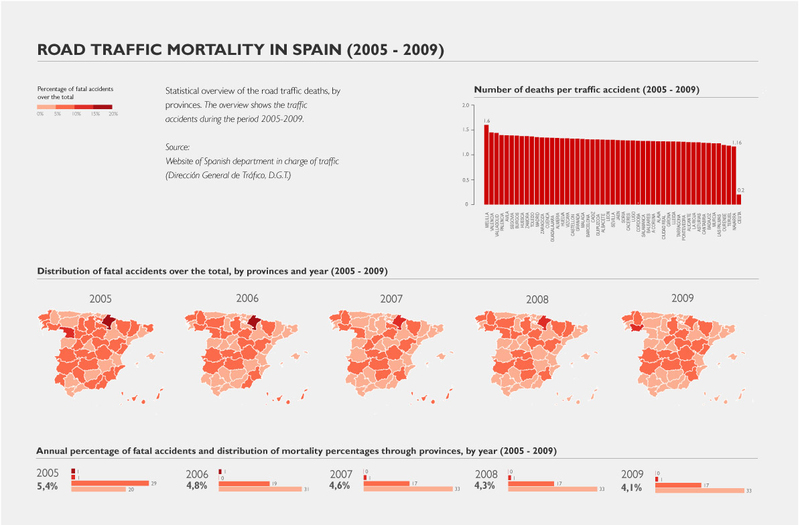 The image is showing the traffic mortality in Spain during the period 2005-2009. My initial goal was just to plot some maps to show the provinces that are the most dangerous for driving, but finally I added some graphs to show more data. The provinces with more deaths or road accidents are not the most dangerous because looking at the data is easy to see that the more population the province has, the more high rate in deaths/accidents has. That means nothing because what we have to look for is, for example, the percentage of fatal road accidents, or the average of involved deaths per accidents. These are good indicators of the dangerousness of a province. The original data sets did not contain this data, so I added this data (percentage of fatal road accidents and average of numbers of deaths per accident) to them and exported the excel files as csv files. To get the map of Spain, (or any other country), visit GADM, an impressive spatial database of the location of the world’s administrative areas. The data is available in several formats, and luckily for us, is available as an RData file. For Spain, different levels of administration areas are provided. We want the level 2, which contains all the provinces of the country. When plotting the map, each province will be filled with a range color, depending on its mortality. As we will use a set of color values to indicate the different levels of mortality, we need to know the maximum value of mortality throught all the years for all the provinces. Here the variable maxMortality represents a maximum percentage of 18,27%. 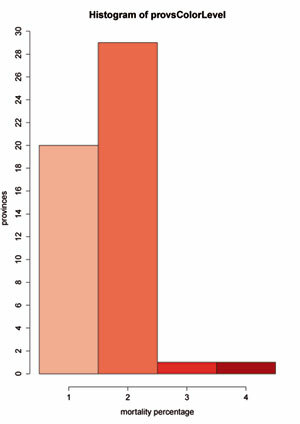 So the set of color values to represent the level of mortality will go from 0 to 20. We are going to split the set of values in four levels, so the first level will cover percentages of mortality from 0% to 5%, the second covers percentages between 5% and 10% and so on. We need a color scheme for these 4 levels, so use the library RcolorBrewer to acomplish that. The process that follows below is done only for the first year of our dataset (year 2005, the first csv of our files stored in the first position of the list ‘globalds’). This process should be done for each year. #position in the csv file. Last but not least, save as a factor the set of color levels from all the provinces and make use of the function spplot to plot the map. For those of you wondering what is a factor, here there is a good explanation. Pretty cool, right? Using R we have created a series of maps with a few lines of code. Looking at these maps you can easily see the provinces with highest mortality percentages. 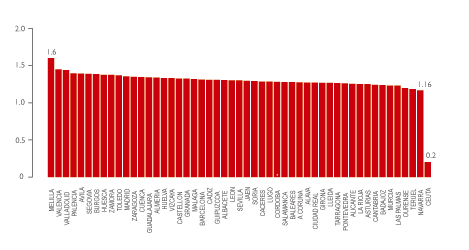 Even you can detect which provinces has increased or decreased its mortality over the time. However, it’s hard to see if there is an improvement of the mortality over the years in the entire country. Was the last year better than the first year? Which is the year with the highest percentage of fatal accidents? These numbers mean good news because that’s probably a sign of improvement in road safety over these years. I’m not going into details, but the hist() function comes with a good set of option to configure the graph but if you want a fine control over the visual aspect, you can create custom axes using the axis() function. 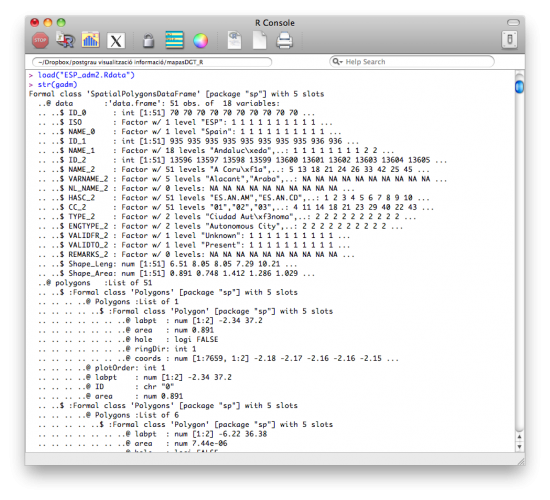 As you can figure out, R is an excellent environment as is designed to analyze data and comes with a lot of R packages to make data graphics with just a few lines of code, so it’s definitively one of the best tools to visualize data. Although the software is not specially friendly with users that are not used to with programming, once you get used to it, the posibilities are almost infinite. 4 Comments • Give your comment! Thanks a lot for this tutorial. It is what I was looking for. It is simple but very useful. I hope I will use it soon. Hi Jorge, I am glad if you find the post useful! Thanks for reading! I have found this post one of the most clarifying regarding the plotting of maps. However, I miss some code just after the two “print screens” you did. I have tried by my own, but I can’t get to draw the color gradient without messing all the output. I would appreciate if you could complete that missing part.